Next week state officials expect the U.S. Census Bureau to officially estimate that the state’s population has passed the five million mark. In fact, they believe the state reached that milestone back on June 8th. Officials estimate that the state is growing by 157 people a day making it one of the fastest growing states in the country. And it’s growing really fast. It took 67 years for the state to grow by a million people, from one million to two million. It took just 17 years though to grow from four million to five million people. It’s a trend that began in 1970. More people have been moving here than leaving. Frank Rainwater heads the S.C. Office of Revenue and Fiscal affairs which keeps track of the state’s population data, says the growth is attributable to two things; jobs and retirees. Over 75 percent of the state’s five million residents live in just 15 counties. Greenville County remains the state’s most populous. All of the state’s coastal counties continue to grow at a fast pace. The Myrtle Beach-Conway area in Horry County is one of the fastest growing areas in the country. 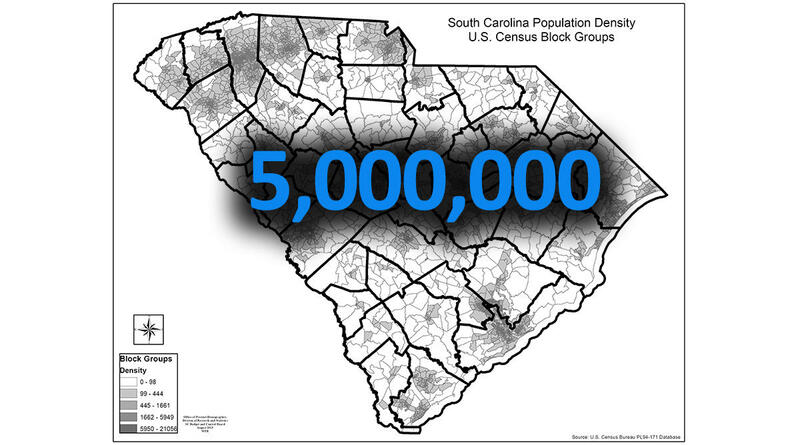 2016 numbers showed that Horry County had grown by over 53,000 people since the 2010 Census. People follow jobs. Officials say the daytime populations in Charleston, Greenville and Columbia increase dramatically as workers commute into the urban areas. On the other hand, Berkeley, Dorchester, Lexington, and York counties see large outflows of residents each work day. It’s estimated that upwards of 50,000 people travel from York County into the greater Charlotte area to work every weekday. While the state is experiencing rapid growth, it’s not seen statewide. 2016 census data showed that 22 of the state’s 46 counties were actually losing population. As a result some small rural counties are struggling to provide good jobs, maintain good public schools, and access to healthcare. Like the rest of the country, South Carolina is growing older. In 1950 the median age of residents was 24. In 2015 the median age was 39. In 1950, five percent of the population was over age 65. In 2015, ten percent was over 65. By 2020 it’s expected this age group to be just under 20 percent of the population. Now at five million and counting, state officials say they see nothing on the horizon that might cause the state’s population growth rate to slow down.